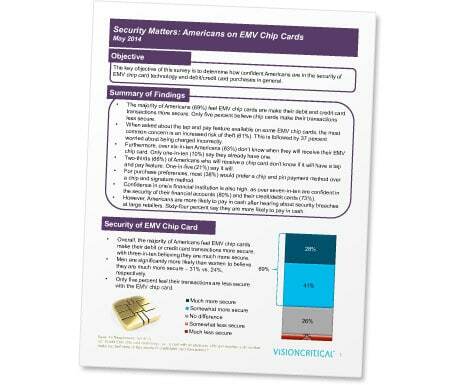 Almost 70% of Americans believe that EMV chip technology makes their debit and credit card transactions more secure, with only 5% feeling chip cards make their transactions less secure, a new survey released by NXP Semiconductors has revealed. The Security Matters: Americans on EMV Chip Cards (PDF) survey, based on the responses of 1,000 American adults, also found that the most common concern expressed regarding contactless cards was the increased risk of theft (61%), followed by 37% expressing concerns about being charged incorrectly for purchases. Some 38% of respondents said they would prefer chip & PIN while 26% prefer the idea of chip & signature, while 36% say its makes no difference which is used. One in 10 have an EMV card today but 63% don’t know when they will get one. “From this survey, we see a high consumer awareness of EMV chip card security and readiness to adopt secure technologies that protect credit and debit card purchases,” says Brintha Koether, director of payments at NXP Semiconductors.